Are you thinking of wearing that beautiful blue dress this season for prom, wedding or any party? But you got confused about what sought of makeup will look lovely with a blue shaded dress. 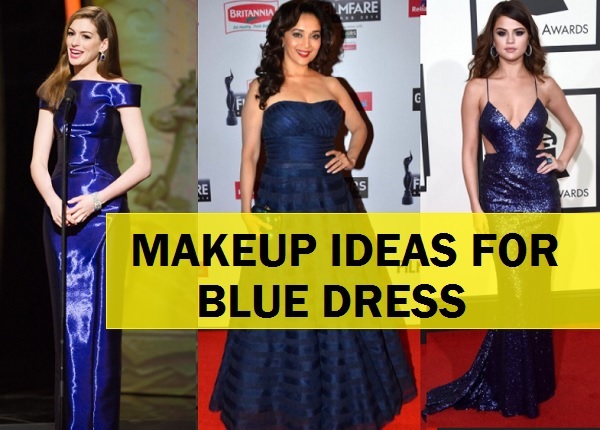 In this article today, we will share the makeup tips that you can use while wearing blue dress. The makeup should always complement your skin color and the dress you are wearing. 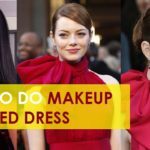 So, keeping in mind the same here are some makeup ideas that will go with your blue dress for sure. Blue dress can be turquoise, light blue, navy dark etc etc in color. Blue is not just one color but is an umbrella term for various shades of blue like, light blue turquoise blue, navy blue, dark blue, powder blue, electric blue, royal blue etc. 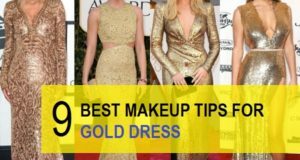 So, most of the makeup tips are applicable to the above mentioned colors. Try these tips and idea to pair up with your blue dress and look elegant and stunning at the same time. Base Makeup is something that would remain the same and does not matter what your skin color or the color of dress is. Basically, the idea of the base makeup with blue dress is to create a smooth and even toned looking skin that also looks radiant and glowing. So, first of all prep the skin using a face primer. Try using a face primer that suits the skin type For. Eg. Dry skinned girls can try a hydrating primers while the oily to combination skinned girls can use a mattifying or an oil control face primer. Priming the face will not only even tone the skin but it will also make the foundation stay longer. We are sure you do not want your makeup look patchy at the ends of the night or the party. Right? Once you have primed the face with a face primer apply the foundation that matches perfectly with your skin tone. Use a foundation brush or just your finger tips if you are comfortable with. It also depends if you would like you have a cakey makeup look or just my original skin kinda fresh look with sheer foundation only. Too much heavy and cakey foundation looks terrible for the day time though it can still look good for the evening makeup. So, keep that in kind while getting ready! 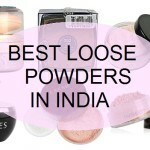 Lastly, try to use translucent and loose powders to set the makeup so that it looks perfect. Even if you have used a sheer BB cream or a tinted moisturiser, then too you can try to top that off with a loose powder to set everything in place nicely. 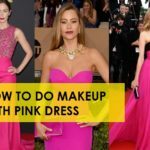 Now that you are wearing a blue dress, you should keep in mind that a pop of colored blush like a red, hot pink, range etc will look mismatched and will only make you look like an exaggerate version of Barbie doll. So, keep the blush softer. Pick shades like light peachy, soft corals or even the light pinks or cinnamon shades if your skin color is dusky. When you are dark skinned then the shade of blush selection become extremely crucial so keep it softer and more natural looking nothing over the top. For the evening makeup you can definitely use a contour kit to make those cheekbones and jaw line look chiseled. Apply contouring powders to add more dimensions and apply a highlighter on the cheekbones and some on the brow bone as well. This will work like magic since highlighted face looks lovely with blue dress. Your dress is blue, so many of us would naturally go for blue colored eye shadows. Well, nothing is wrong in that. If that color of blush is natural and subtle looking then the eye shadows like blue can be tried with a blue colored prom dress or a blue brides maid dress. With blue metallic eyes looks the best. 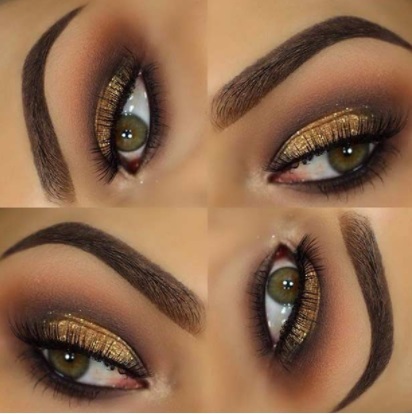 You can try a metallic blue or try gold on the eyelids and use a blue eye shadow on the crease to define your crease. 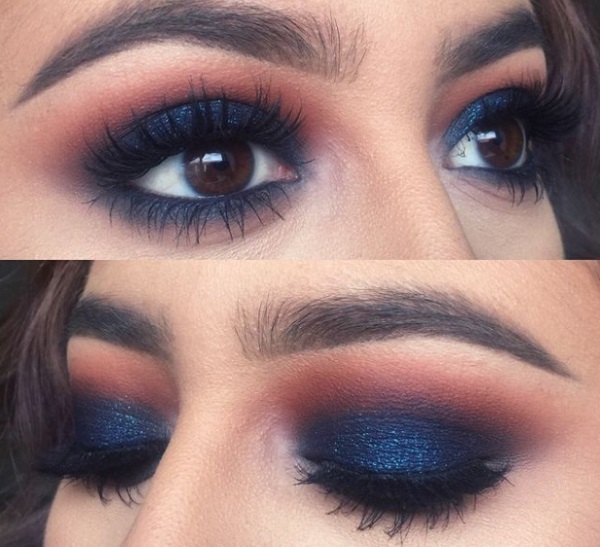 If the dress is dark blue or navy blue then choose an eye shadow color matching with that. So, now you know which eye makeup you need for the navy blue dress. Or another way to do eye makeup with a blue party dress is by using a subtle gold on the eyelids and a blue colored eyeliner. You can wear the eyeliner in bold shape. For e.g a thick winged shape. Smokey blue eye makeup looks good too. Never wear your eye makeup without the eye shadow base or an eye primer. You will thank us later when you will notice the difference it makes to your eye makeup. 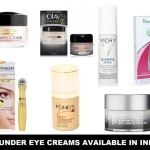 Apply the eye base and wait for 10-15 seconds. Apply the eyelid color with a flat applicator brush and pack the color by patting. Then taking a fluffy brush use the crease color. Blend well till everything blend nicely without any harsh edges. Now it’s time to apply the eyeliner. Try the shape that suits you the most like the regular think shape or the thick winged eyeliner. Apply mascara and coat the lashes. Take a tiny clean brush and dip that in a highlighting color, colors like vanilla, champagne etc works nice as a highlighting color. Apply the highlighting shadow on the brow bone for a beautiful look. 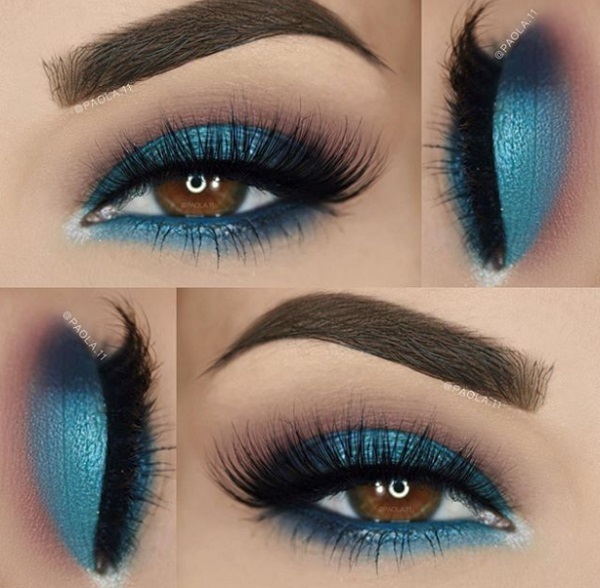 If your dress is dark blue or navy blue then you can also try a smokey black eye makeup look but with light blue or turquoise blue try to keep the eye shadow lighter. For your blue dress, you can try a neutral lip look. Like we will suggest, if you have done a dramatic eye makeup then keep the lip makeup or the color of the lipstick neutral. So, choose a light natural ink or peachy color. But if you have tone down the eye makeup then try a hot pink or even a bold orange that looks lovely with the blue colored dress. You can try red but red with blue is not the best pair is what we think. Blue dress and hot pink lipstick still looks rocking. If your dress is royal blue in color in a corally or peachy pink will look the best. With Navy blue dress, you can try red lipstick. Jessica had pared with bright blue colored off shoulder dress with natural makeup for the eyes and a coral lip color. The lip color looks stunning with the blue as they complement each other. If you will notice the blush is very light and bronzer is evident more. Natalie has paired her short Satin navy blue dress with a gorgeous smokey eye makeup. The eye makeup like this looks great with navy and blue colored dresses. Her lips on the other hand are kept very neutral and natural looking. A very subtle light peach blushes that is nearly detectable add glow but gives her no extra color. The same is being replicated by the popular beauty vlogger. She has paired her navy blue dress with a super smokey black eye makeup with very neutral lips. Surely she looks stunning. Selena has paired her bold sequined navy blue dress with soft smokey eyes with a very natural pink lipstick. You can also try a light orangish or peach with a blue colored attire like this. 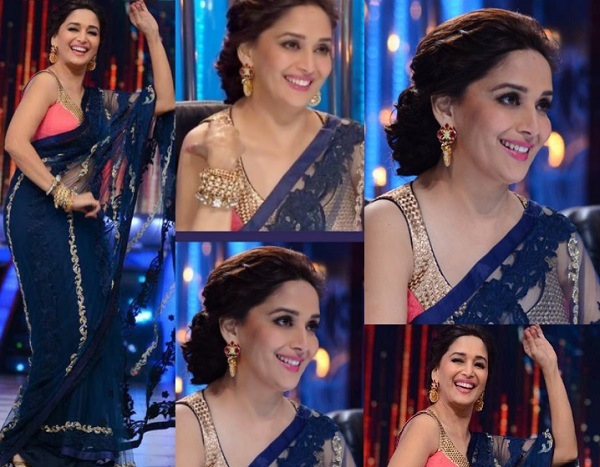 This is what Madhuri Dixit has done here in this look of hers in a blue dress. Madhuri has paired her smokey eyes with a light pink lipstick looks good for her skin complexion. Aishwarya too has kept the focus on the eyes and her pretty saree with a nud@ matte lipstick. 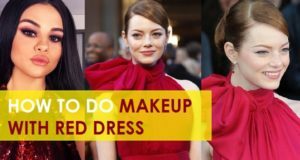 So, these were the makeup ideas for the blue dress and makeup tips that you must try to look gorgeous? 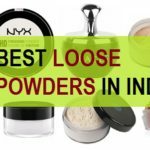 8 Best Translucent Powders or Loose Powders in India: Our Top Picks! !